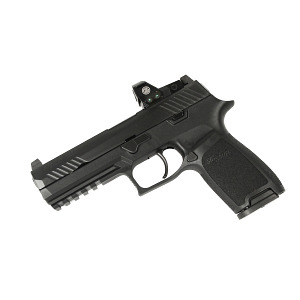 New from Sig Sauer comes the P320 striker fired pistol. Featuring a newly designed striker fired action that is pretensioned for a crisp light pull and a short, positive reset. Slide takedown is prohibited without removal of the magazine, and takedown is accomplished without tools or manipulation of trigger for enhanced safety. A five point safety system as well as the ability to completely change caliber and grip configurations for different size hands make this ideal for duty or home defense. The 320 RX variant features a milled slide coupled with the Sig Sauer Romeo 1 Reflex Sight and tall suppressor night sights. Comes with two 17RD magazines, Romeo 1 Reflex sight, lock and case. The pistol trigger is heavy, however I haven't shot many rounds due to the fact that the Romeo 01 reflex sight was defective and had to be returned to Sig (when the Romeo is removed, there is no cover included to protect the empty screw holes). Problems similar to mine have been reported on the internet by other P320RX owners, although Sig says they know of no problems with the Romeo. Turnaround time to repair or replace is estimated at 3-6 weeks from Sig.